I am not sure if all pilots associate flying with the spring or if I just do it because that is when I started learning to fly last year. But, Spring is a great time to fly. For the past few months I have not flown as much. It just is not as much fun to pre-flight a plane in the dark and the cold not to mention it has been cloudy and overcast for much of the winter. But, with the time change behind us providing more evening light combined with warmer weather I am itching to get back out to the airport and in the air. The weather looks to be nice this weekend so I plan on reserving a Cessna 152 or 172 on Saturday or Sunday. The Katana I flew recently although more sporty does not allow you to open the windows and I am looking forward to getting up in the air and letting some cool spring air float through the cabin. Earlier this year I posted about AOPA sponsored Tsunami relief efforts. In a recent AOPA ePilot Newsletter they announced that member have donated more than $115,000 to Air Serv International. 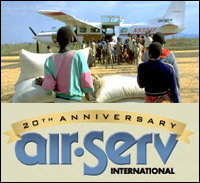 Air Serv is a non-governmental humanitarian organization that used GA Aircraft to provide logistical support to other non-governmental humanitarian organizations. According to the AOPA Newsletter "Air Serv's C-208B Grand Caravan is being used to transport humanitarian staff, emergency medical supplies, and rabies and tetanus vaccines to Banda Aceh, one of the hardest hit towns in Sumatra. The material is then transferred to helicopters for transport to displaced person clinics along the west coast of Sumatra." Stu Willcuts of Air Serv said "All of us express our deep appreciation to our AOPA partners for this significant response." Air Serv International is a non-government and non-profit organization that assists the world's leading relief and development agencies in getting their cargo and humanitarian staff safely delivered to areas of need. According to a recent Aircraft Owners and Pilots Association newsletter, "Air Serv brings badly needed logistics support, equipment and hope to millions of people in some of the harshest environments in the world. Its staff is currently deployed in Sri Lanka and Sumatra, some of the areas hardest hit by the tsunami." AOPA has selected Air Serv, an approved agency by the USA Freedom Corps, as a partner in its Tsunami relief efforts. AOPA, in conjunction with Air Serv, established the AOPA Tsunami Fund with all funds going specifically to support relief from the tsunami disaster. AOPA has pledged up to $25,000 to match member contributions. To learn more about how anyone can make a donation and AOPA members can make a donation that will be matched, visit the Air Serv Give a Gift page on the Air Serv Website. 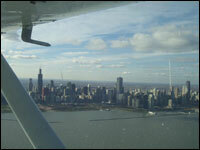 I enjoyed reading a variety of reports from the field that are posted on the Air Serv International Website. Even one that shares how Air Serv came to the rescue of Angelina Jolie while she was on a goodwill tour in the Democratic Republic of Congo. You can also learn about the fleet of general aviation aircraft used on their missions.